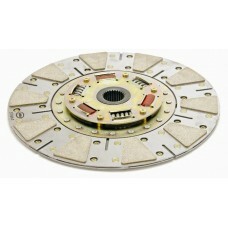 McLeod Performance 500 series clutch disc for modified engines up to 500HP. Features a conventional 100 series face on clutch pressure plate side, whilst utilising Ceramic pads on the flywheel side to handle more power. 1-1/8” x 26 Spline, 11” diameter disc for high output engines in street / strip use. Application: GM & Tremec 3550/TKO transmissions e.g. TRE600FD.